In this year we saw a break through in WordPress portfolio themes. Clean and minimalistic style, usually with simple borderless grid was the most successful approach. There was a lot of very popular WordPress Themes of this sort released on Themeforest this year and below is a list of some of the best ones. Daisho certainly brings freshness to otherwise satured WordPress. It is a portfolio solution for creative professionals and companies looking for a minimal and professional look. The greatest appeal is that it combines professional and playful look which is a real rarity. Daisho is definitely worth every penny. If you are a photographer in search of a new website you simply can not overlook Hypershot. Photographies are presented with a simple grid and a subtle hover effect. 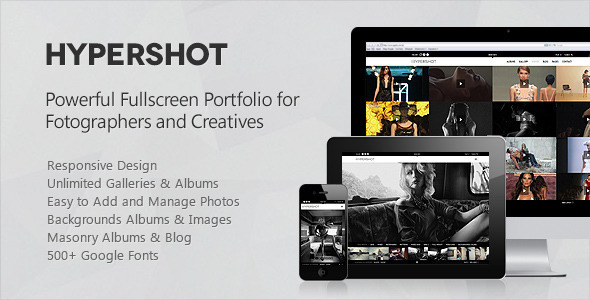 It is a Responsive Powerful Fullscreen Portfolio for Fotographers and Creative Users built with latest WP features. The latest trend in web design are the Retina Ready Themes which make a full use of the new resolution density made by Apple. 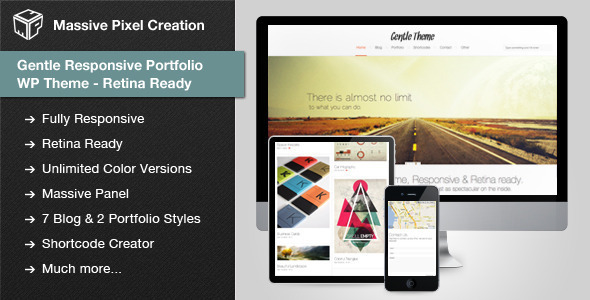 Gentle is a advanced portfolio Theme that makes full use of the Retina displays. Easy to setup, enhanced with Massive Panel and custom shortcode wizard which makes adding shortcodes extremely easy. 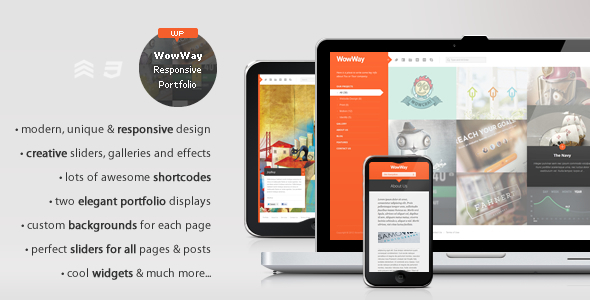 One of the first themes on Themeforest with this sort of grid design and sort of a pioneer is WowWay by Ruben Bristian. 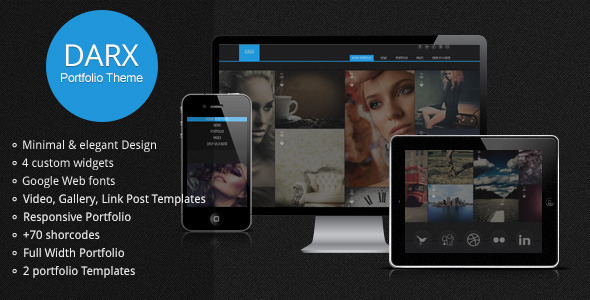 It is an incredibly unique and highly interactive WordPress theme for creative portfolios. Based on a responsive grid, packed up with lots of cool features and built on a powerful admin panel, this can become the perfect theme for you! If you prefer a dark design, then Darx is a Theme for you. With minimal and elegant design this is a perfect Theme to display your latest projects or photographies. It is a responsive portfolio WordPress Theme, suited for creative folk that wish to present their products or services in a fresh way. 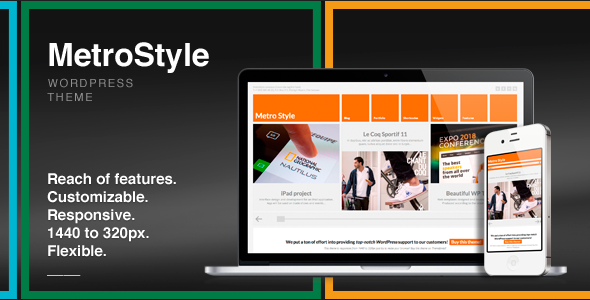 Metro brings, as the name suggests, a new Windows 8 design to WordPress. This is a Theme unlike any you have seen before, thus definitely worth checking. Original squared design and 1440 to 320 pixels keep this theme stay ahead of the curve and is something really fresh in Web Design. While it doesn’t follow the portfolio grid look, it is worth checking because of it’s unique approach. 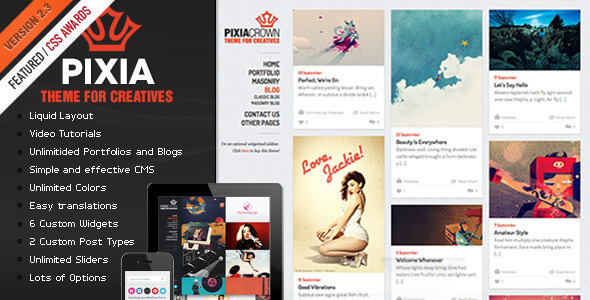 Pixia is a Theme with numerous design awwards at well established CSS galleries like Awwwards, CSS Awards, Creattica and CSS Light. And they are well deserved. 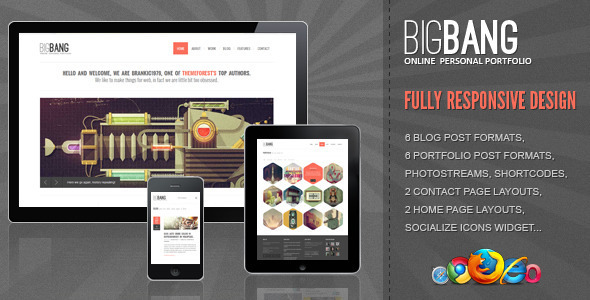 If you like Pinterest or Dribbble design then this Theme is perfect for you. You can choose between Pinterest look and clean borderless grid, meaning this Theme is very versatile. Using a modern and liquid layout you can get a stylish website in a few minutes. A fully responsive Theme with 6 portfolio formats (including the unique hexagon portfolio grid) nicely rounds up our premium collection of Portfolio WordPress Themes. Year 2012 brought several new approaches in portfolio grid design and I am sure many of the Themes above will be to your liking.